books about blueprint reading, electrical wiring and automotive mechanics. sold to Dillards. His original Canal Street store would eventually become a hotel. became a four-year institution in 1970.
only southern state never to have a Miss America. deaths of two Alabama teenage girls. adjacent to the airport. All 145 souls on the flight and three local residents were killed. their way to a family funeral in Las Vegas. initiate efforts to neutralize the Klan in that area of the Deep South. River in the summer of 1944. Prisoners were not forced to work, and some refused. necessities as toothpaste or snacks at their own Post Exchange. 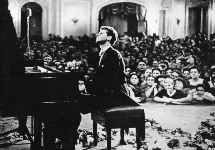 Piano sensation Harvey Lavan "Van" Cliburn Jr. was born in Shreveport today in 1934. Soviet leader Nikita Khrushchev to give first prize to an American. "Is he the best?" parade in New York City. Commission to fund studies of the life history of crawfish in small ponds. lose to Earl K. Long.